Wide-mouthed eighth wonder of the ancient world Charlton Heston is back in this sequel to the iconic sci fi film. It sees a new astronaut arrive on the mysterious planet (*cough* Earth), who finds his way to the now underground New York, where a race of super-intelligent humans who can communicate and control things with their minds worship a doomsday weapon from the 20th Century. As we disagreed substantially on this film we thought that, in the great tradition of Socrates, we would review it as a dialogue. Stay with it. Dan: So it starts out pretty much like the first film, to the point that it appears to be aping the original movie. They even cast a new lead (James Franciscus) who looks so much like Charlton Heston that I can only assume he was his understudy. Alex: But they did have the real Charlton Heston too, so I can only assume that was for creative rather than budgetary reasons. And you can hardly complain that it was too much like the original. Dan: It just felt like monkey business as usual. What was it you enjoyed? Alex: What I liked about it is that it did something completely unexpected. I thought it would be a worse re-run of the first film – a new pilot arrives, discovers the apes, has some sort of run-in etc. etc. But instead they took this totally alien world and explored another aspect of it. Dan: It did take a turn for the unexpected, but it wasn’t acted, written or directed well enough to hold my attention while it went bananas. See what I did there? Alex: Yes, and it’s true it wasn’t brilliantly made, but like a good episode of Star Trek I could overlook its flaws (like the acting or how dated it looks) because it made me think. Dan: All it made me think of was those old PG Tips adverts. Alex: After they had to stop using real monkeys? Dan: Exactly. 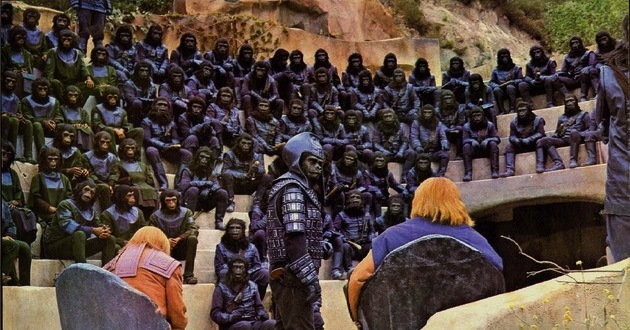 I found Beneath the Planet of the Apes to be beneath mediocrity. Alex: I disagree. The first one was an analogy played out over a whole film, with the worst managed twist ever. Once you’re over the fact the apes are treating humans how humans treat animals there’s not much to it. This one had all the stuff about humans worshipping weapons, and the idea of a race who have incredible mental powers that don’t extend to the physical so have to rely on illusion. I’ll admit those two things felt a bit disconnected, but it’s better than re-treading the same territory. Dan: I found the original film much more robust, both in terms of its ideas and plot. Here, I had no idea what was going on. Alex: There were humans who could control things with their minds and they live in New York under the ground, except the Statue of Liberty which is at ground level, and they need to hide from the apes and worshipped a bomb. What’s not to understand? Alex: I’m just hoping they try and explain the telepathy people in War for the Planet of the Apes. Dan: They should have called it Gorilla Warfare.